Mumper just made quite a few posts regarding upcoming changes to the Pet Battle System. You can find them here and here. By far the biggest most welcome change is the one about getting PvP flagged. 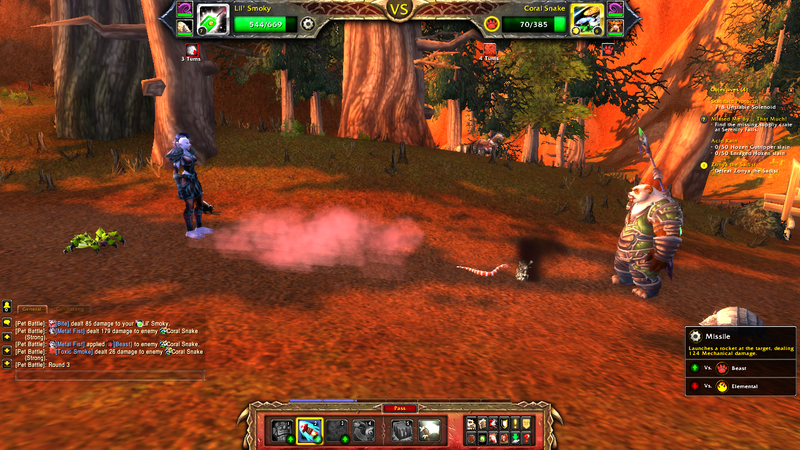 Players are vulnerable to PVP while in a pet battle on PVP servers. We have added a buff that will reduce the amount of damage taken once you are broken out of battle by 50% for 3 seconds. PVE players are only affected if they are flagged or in an area that forces flagging. In addition, the exact pet you were fighting will respawn. Increased the quantity dropped and the drop rate of pet bandages from daily quests. Cooldown on Revive Battle Pets reduced to 8 min. It’s getting close to release. I can’t wait!! !